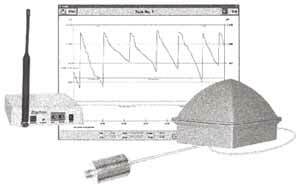 CHEM SHOW '99: The TankScan MIR (Micropower Impulse Radar) direct level measurement system incorporates a fully solid-state sensor with a weighted flexible wave guide for high resolution continuous sensing of tank fluid level. CHEM SHOW '99: The TankScan MIR (Micropower Impulse Radar) direct level measurement system incorporates a fully solid-state sensor with a weighted flexible wave guide for high resolution continuous sensing of tank fluid level. It is a low cost, high performance remote distributed process inventory management hardware/software solution with minimum installation expense. The battery powered MIR sensor accurately measures level, with data transmitted by radio to a receiver/modem. The receiver sends the data via a preprogrammed dial-up modem to a desktop computer. The comprehensive DataScan PC software manages database and alarm functions, data analysis, reporting and polling and is an easy-to-use solution for distributed vendor managed inventory. Combining wireless measurement technology with advanced sensor design, the TankScan remote system offers low installation cost because no wiring is required, low maintenance due to no moving parts and safer electrical operation by using a battery power supply. Barton Instrument Systems, LLC, Box 1882, City of Industry, CA 91749. Tel: 626-961-4452 or 800-522-7866. Fax: 626-961-4452.